Norwegian Cruise Line will once again bring the best of Broadway to sea, with the 2006 Tony Award® winner for “Best Musical,” Jersey Boys, and a completely new and original show created by Tony Award®-winning director and choreographer Warren Carlyle, headlining on the Norwegian Bliss’ main stage, the Bliss Theater. The ship will also feature a new comedy club and nightlife venue, a new theatrical cocktail hour experience, Happy Hour Prohibition- The Musical, an outpost of the legendary Beatles’ venue The Cavern Club and much more. “With Norwegian Bliss, we are continuing our legacy of bringing our guests the finest entertainment at sea,” said Andy Stuart, Norwegian Cruise Line’s president and chief executive officer. “Our entertainment team is bringing to life dazzling displays and award-winning musical sounds across our fleet, and Norwegian Bliss will continue that legacy with the Tony Award®-winning Jersey Boys and incredible new concepts created just for this spectacular ship.” Norwegian has paved the way for outstanding entertainment in the cruise industry, as the first cruise line to feature branded entertainment in 2010 aboard Norwegian Epic. Today, Norwegian is known for its bold and vibrant musicals and Broadway-style shows. Norwegian Bliss will build on the company’s success and commitment to excellence in entertainment with the ship’s two main stage shows. Headlining in the Bliss Theater will be the 2006 Tony Award®-winner for Best Musical, Jersey Boys. The show goes behind the music of Frankie Valli and The Four Seasons, and follows four blue-collar kids working their way from the streets of Newark to the heights of stardom. Jersey Boys features all of their hits including “Sherry,” “Big Girls Don’t Cry,” “Oh What A Night,” “Walk Like A Man,” “Can’t Take My Eyes Off You” and “Working My Way Back To You.” Jersey Boys will hit the high seas for its first production at sea after 11 record-breaking years on Broadway. As one of the longest running shows in Broadway history, including many world tours, Jersey Boys has been seen by more than 24 million people worldwide. Jersey Boys is written by Marshall Brickman and Rick Elice, with music by Bob Gaudio and lyrics by Bob Crewe. Norwegian Cruise Line is currently developing an exclusive original musical theater show created and produced specifically for Norwegian Bliss. The new show will be a Cuban-inspired Broadway-style musical created by Tony Award®-winning director and choreographer Warren Carlyle, featuring electrifying dance, colorful pageantry and sensational sounds developed by some of the most sought-after names on Broadway today. Warren Carlyle has worked on countless Broadway productions; acclaimed as one of Broadway’s best, Carlyle most recently choreographed the Broadway musical Hello, Dolly starring Bette Midler and directed and choreographed After Midnight, which earned the Tony Award® in 2014 for “Best Choreography” and is currently delighting audiences on Norwegian Escape. Norwegian Bliss’ new show will also feature costumes by famed Cuban-American fashion icon Isabel Toledo, whose diverse design eye has made her a coveted name in high-end couture, mainstream fashion and Broadway costume design, having designed for First Lady Michelle Obama as well as earning a Tony Award® nomination for “Best Costume Design” in 2014 for After Midnight. Isabel’s husband, Ruben Toledo, will be developing the new show’s art and scenic designs; also a Cuban-American artist, Ruben’s work has appeared across the globe including in Vogue magazine, the Metropolitan Museum of Art’s Costume Institute and the Victoria and Albert Museum in London. More details on this incredible new show will be shared this fall. Norwegian Bliss’ guests will have the opportunity to travel back in time to January 16, 1919 – the eve of the Prohibition era – for a rowdy good time with the new show, Happy Hour Prohibition- The Musical. Created by Broadway sensations Holly-Anne Palmer, whose creative talent has been featured in hits like Bring It On and Jersey Boys, among others, as well as Liz Muller and Collin Simon of Pipe Dream Theatre, Happy Hour Prohibition – The Musical will hit the high seas after delighting audiences for nearly two years in New Orleans and New York City. Guests will join the talented cast in Miss Lulu’s infamous New Orleans speakeasy, Mahogany Hall, as they entertain with tales of bootleggers and intoxicating choreography by Broadway veteran Lauren Lim Jackson, set to some of the era’s most famous tunes including Let’s Misbehave, Happy Feet and Makin’ Whoopee. During the one hour performance, guests will savor their own Prohibition era specialty cocktails, each with a modern twist. The show will be performed on select evenings as a happy hour pre-dinner show and once each cruise as a late night adults-only show in the Alibi Comedy and Nightclub. In an expansion of the successful partnership that began during Norwegian Epic’s recent renovation through the Norwegian Edge™ program, the extremely popular rock and roll venue The Cavern Club will delight guests aboard Norwegian Bliss. The Cavern Club is inspired by the Liverpool club where the Beatles performed frequently in the 1960’s. 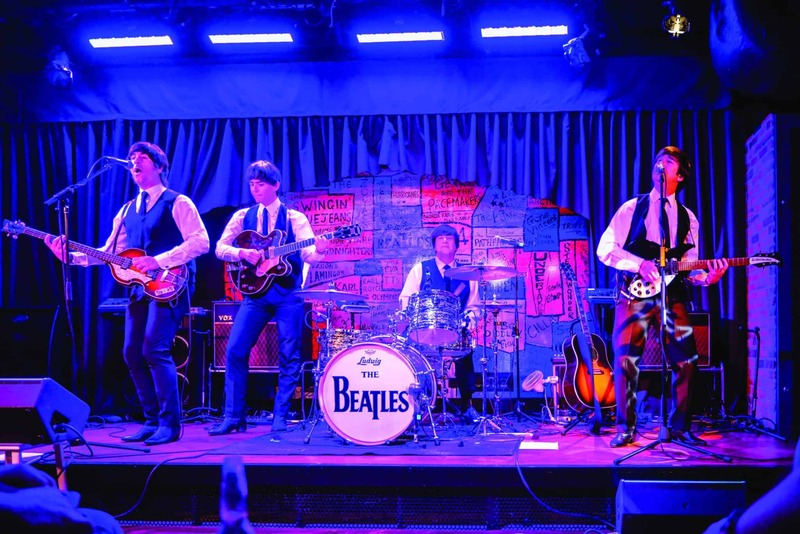 The lounge brings rock and roll to life with nightly live performances and a Beatles cover band singing hits like “Penny Lane,” “Yellow Submarine,” and more. For more information on Norwegian Bliss, including an animated video of the ship’s accommodations, please visit bliss.ncl.com. To book a cruise aboard one of Norwegian’s newest ships, contact a travel professional, call Norwegian at 888-NCL-CRUISE (625-2784), or visit www.ncl.com.